Warning: This post discusses death and descriptions of the moments afterward, as told through past-life regression, mediumship transcriptions and other sources. If you feel this post will bring up painful memories or fears, please consider carefully before clicking through. I realize this is a dark subject to discuss, and my intent is not to salt the wounds of the recently bereaved who may happen upon my site. On the other hand, I believe that reading the reassuring words of the many people who have come back across the veil to bravely tell us of their experience can be of great comfort. While their experiences, thoughts and reactions are unique to each passing, there is a nearly universal message of healing, peace and the distinct feeling of going ‘home’. So if you are open to considering the spiritual evidence that is available on the topic, perhaps it can help to demystify what occurs at death, even if such taboos make the subject delicate. Accounts of death and transition are selected from over a century of mediumship transcriptions, channeling and life-between-life regression experiences. In places where you see this symbol, […], I have skipped sentences and/or paragraphs from the original text for the sake of brevity. Note: While I have found no indication that any of these original sources are fraudulent, I would always encourage the reader to determine the legitimacy of each of these sources for themselves. A.D. Mattson, S. T. D.
This highly-detailed transition experience is indicative of the kind of passing experienced by those in hospice or at the end of a long illness where transition is slow and more deliberate in nature. 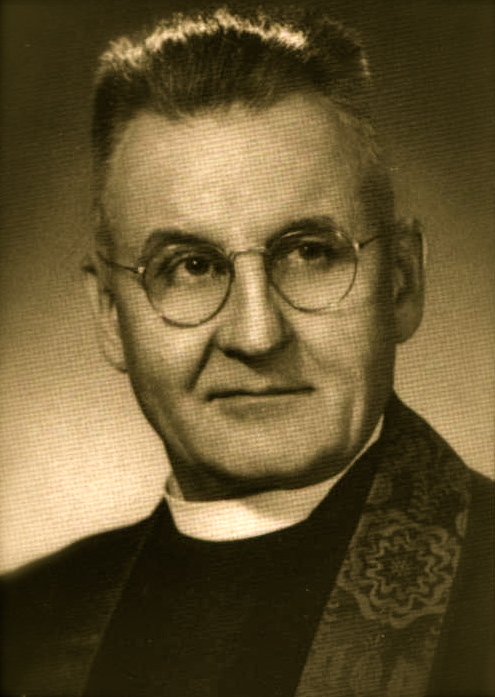 Mattson’s entrance into the spirit world contains typical Christian imagery matching his expectations as a Reverend of the Lutheran faith. Transition experiences are commonly personalized in this way to avoid disorientation, as explained to Mattson by his loved ones in the spirit world. Mattson’s description is straight-forward and matter-of-fact. Future examples, by contrast, will show more dramatic reactions to transition however, as Mattson was devoutly religious, his death and entrance into the spirit world were both expected and welcomed. It is a wonderful example of a most gentle passing and welcome reception. These communications were received by the English clairvoyant Margaret Flavell Tweddell and transcribed by AD Mattson’s daughter, Ruth Mattson Taylor. Communications amounted to 500 legal-sized typed pages produced over the period of two years. The book that resulted, Witness From Beyond: New Cosmic Concepts on Death and Survival, contained portions of the communications that the author felt would be of interest to readers. The last few days before I passed, I was coming and going, coming and going. I was definitely aware. You know if you are half asleep, you can be aware of somebody coming into the room and you just don’t want to wake up. You know they’re there and you think ‘oh, well, if I stay asleep they’ll go away’. In the beginning I was conscious of my mother, of my brother, and my father around me. I was conscious of going to other countries and other places, but I really didn’t want to go. I wanted to stop where I was. That was the physical body holding me. I would come back and I would tell you where I’d been. I was very aware of you and Al there [A.D.’s children] with me in the room. It was good to have you there. I needed you. There was this tug between going and staying and going and staying. As I went more and more, I loathed more the coming back. I felt regretful to leave, but I felt shut in when I got back. But not truly shut in because I wasn’t properly in my physical body. I was partially in and partially out. My body became a very uncomfortable vehicle. It became very clumsy. My feet were so clumsy. I didn’t feel as if I could move my feet somehow. They were like heavy clogs. They didn’t feel like feet. Then the rest of me began to feel heavy like that and it was an effort to lift my arm up. It was an effort to turn my head. I began to feel as though I didn’t have enough effort. But it was so easy to go out and be out there. There was no effort to do that. Then I had this magnificent, wonderful vision. There were the gates. 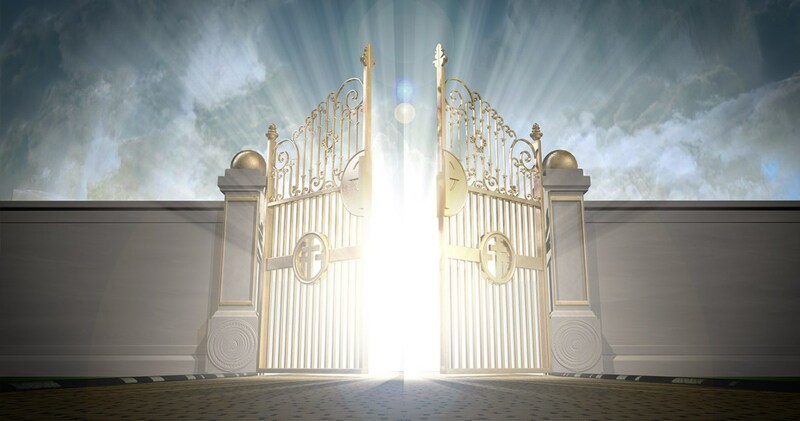 I had always envisioned that the entrance to my paradise would be through these magnificent gates. There’re gates of life – of light. They’re living gates. They’re moving all the time. They’re not wrought iron or stone or wood. There was this beautiful gate opening, and there were all of my family coming backward and forward to greet me. Then I saw them. They came back. My family. They came back, and I looked at them. I no longer saw them as I’d seen them – like my children. They were no longer my children. They were souls that I had been blessed enough to provide bodies for. They tiptoed in and they looked at me. I didn’t see them with my physical eyes. I saw them blurred. I couldn’t really tell them whether wanted them to stay or go. I just thought it was beautiful to have them there. I looked, and as I began gradually to leave them I had the most beautiful sensation of the complete unity with all things and all people. Well, the rest seems to be just light and sound and music, and the looking back, and the sending my love, and going around to the back of my children and just putting my hands on them. I think I must have slept a bit because I don’t remember. I remember coming through the gates and hailing Peter and a few other people, and suddenly I was in the most beautiful garden, sitting in a chair. They were all saying ‘Let him have a rest. He must rest. He must have a sleep’. But I didn’t. Somebody must have hypnotized me because I slept and I rested. People came and went. I smiled at them and thought how beautiful they all were. They didn’t have any faces. They were just a lot of light. Ruby [his sister] came and she blessed me. I was still reluctant. I thought, ‘Dear me, suppose they say something critical of me? I then went out into darkness, into the most beautiful, soft, enveloping darkness. The man I have learned is my guardian said, ‘Come on, come on,’ and when he said ‘Come’ it raises you and lifts you. I then had a nice, long sleep in a most beautiful bed in an arbor. 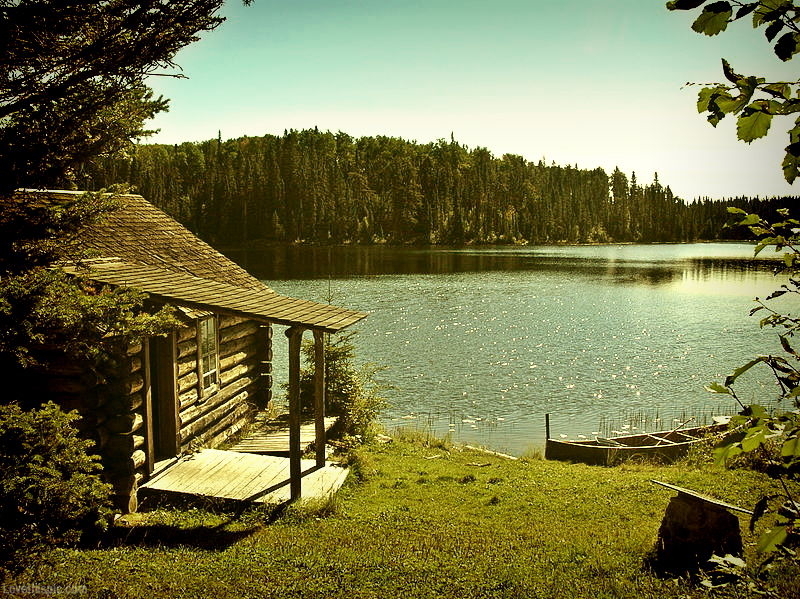 And there was my lake and there were fish, but nothing like my cabin. It was the most beautiful, light and airy. Well, here endeth the lesson. Part II introduces us to a death experience as told through a life-between-life regression. The subject, “Sally” and her husband “Will” are met by a warring band of native Americans sometime in the 1800’s as they travel with a wagon train west. In contrast to the tranquil transition experience expressed by A.D. Mattson, the young Sally struggles with her passing until she is able to convince her grieving husband that she isn’t gone forever. I have just discovered your site and already find myself in broad agreement with much you have to say and intensely interested in the content you post here. On this particular subject, perhaps you might be interested in some similar accounts transcribed by the late medium, Andrea Grieveson (search for the author by name at Amazon.com). On a more general note, we have a forum dedicated to the discussion of such phenomena. We call the forum Psience Quest (psiencequest.net) and would welcome your input should you care to join our discussions. Otherwise, thank you for a valuable and interesting resource. Thank you very much, David! I will definitely check out your forum – thank you. I’ve never heard of Andrea Grieveson, but I will search it today. Thank you so much for the recommendation. This was……. phenomenal, so much that I HAVE to continue reading and follow you! Thank you so much! What a gracious compliment, I’m so glad that you are enjoying the site. Thanks for the follow! Don’t forget to read back-posts, life after death as a topic doesn’t change very fast, so all continue to be relevant. What an uplifting account but sadly not all passings are so blessed. I shall look forward to the next story. Thanks for the comment. Its true that in some cases, transitions aren’t as smooth. Our free will is always maintained and it does seem that help is always available. the next story I’m going to post illustrates an unexpected passing that might be considered less than smooth, and later down the road, I’ll probably post a transition where the person elects to stay on the earth plane.